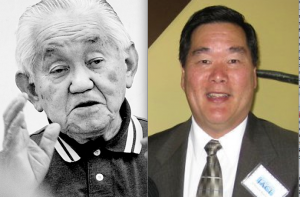 Pacific Southwest District JACL will hold its 16th annual awards dinner, themed “The Living Legends of JACL,” on Saturday, Oct. 6, at the Center at Cathedral Plaza, 555 W. Temple St., Los Angeles. Reception at 6 p.m., dinner at 7 p.m.
Left: Harry Honda. Right: Jefferson Kunisaki. Through example and spirit, the honorees reflect JACL’s legacy and commitment to greater diversity, inclusion and social justice in society. • Union Bank, which has served the Japanese American community since the establishment of Bank of Tokyo of California in 1952. • Harry Honda, who worked at the JACL’s newspaper, The Pacific Citizen, in various capacities, including editor and general manager, for 50 years. • Helen Kawagoe, who served as city clerk for the City of Carson for more than 37 years and as national president of JACL from 1996 to 2000. • Jean Ushijima, West L.A.
Tickets are $125 per person, $1,250 for table sponsors (10 seats). For more information, contact Gary Mayeda at (213) 626-4471 or email [email protected] Visit the district’s website at http://jaclpsw.org/.